The following activities will be taking place during festival hours. Be sure to pick up a flyer at our welcome tent to find the most current times. The book festival is open to the public, free to attend. for use by teachers to help support their students at the entrance. tissues, sanitizing wipes, or other essential items. We will have guest speakers this year with a range of topics. Speaking schedule will be announced. will be running a mini prompt writing workshop at her tent throughout the festival. For all ages, it includes a free gift for stopping by. will have some friendly, attention-loving dogs at the festival. They'll love hearing stories read by your kids! The American Legion and its Auxiliary provide support throughout the community year round. While you're at the festival, grab a hoagie and a drink to support their efforts! Who's Hangry has a great menu cooked up and they will be serving from 11:30 - 1:30. Garden items plus a BElieve in THE GOOD IN THE WORLD T-shirt. If winner is not present at time of drawing (3:45, July 21), you must meet in Mercer to collect the crate. We also have an online T-shirt sale fundraiser that will go to the park for upkeep and maintenance. Info at fest and will be shared on our site and FB page. A crate full of school supplies, including a small back pack and a Reading Gives You Roots tee, plus a $10 Gift Card to Leana's Books & More (donated by Leana's Books). 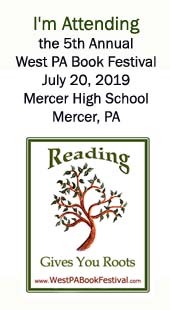 Ryanne Michaels, Miss Mercer County PA High, will have a box set out to collect school supplies for those in the area who need a little help getting started this coming year. Bring unused notebooks, pencils, markers, tissue boxes, etc. to drop in the box.